Save 10% today... This very pretty Fostoria candlestick shows the acid etched June pattern (#5098) of flowing ribbon bows and flowers. The candle holder has a 6 sided waist that flares to the rim. The foot is 4 3/4" across and it stands 3 3/8"" tall. It is in excellent, unused condition. The June pattern was made in several colors, but it is quite rare to find a piece that is crystal clear. Production dates 1928-1951. 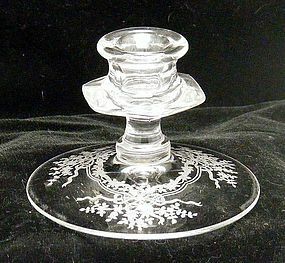 I have Fostoria and other elegant glass in my inventory... take a peek. Insurance and confirmation is included in the price.